Thread Description:What to do and what not to do! So I found a baby bird…what do I do? Before you do anything, determine if the bird actually needs your intervention. Is it really an orphan? Sometimes a juvenile bird has just left the nest and is being taught how to live on it’s own by it’s parents when a well meaning human comes along and takes the bird inside, thinking it needs rescuing. (The bird may be hopping on the ground, calling to its parents to be fed, etc.) In this case, just watch from a safe distance and make sure that the parents are feeding the bird. Also, do your best to keep predators away (cats and dogs) while the fledgling gets its bearings! If you do not see the parents in over an hour or so and the bird still seems helpless, it may be orphaned. Perhaps it fell from the nest, is injured, or the parents were killed. In this case, you ought to rescue the bird. If the bird is injured, rescue the bird even if the parents are there. If the bird is an infant (naked, without feathers, or with only some feathers) you should try to find the nest that it came from and replace it. If you find a destroyed nest near where the bird is, if possible, repair it or create a replacement nest. (Such as a butter tub with grass and moss in it, a green strawberry basket from the super market…half a dried coconut…whatever seems suitable and is available to you!) poke holes in the bottom for drainage and secure it in the old nest’s location. Watch from afar and see if the parents come and feed the chick. If they do not return to the nest in an hour, you can assume the bird is abandoned or orphaned. If you replaced the chick in a nest, but it is thrown out a second time, you should rescue the bird. Your first priority is to keep the baby warm and to calm the bird down. Your instincts may tell you to feed the bird immediately, but this can be very harmful to the bird if their body temperature is not warm enough. Also, birds can easily die from too much stress. So the first thing to do is to get the bird to a warm and quiet place and let it rest for a while. To keep the bird warm, there are a few things you can do. Put the bird in a nest made from a round plastic tub (such as a butter tub, whipped cream tub or similar) lined with soft wads of toilet paper (which you can easily replace when the bird poops) Put this nest on a towel or pillow case on a heating pad set to low or medium in a basket or cardboard box. You do not want it to be too hot, so make sure the bird can move away from the heat if necessary. Keep the bird out of reach of pets and in a relatively quiet location. Maybe you have a reptile heat lamp or a hot water bottle you can place near the bird? Your goal is to achieve 85 to 90 degrees Fahrenheit (30 to 32 degrees Celsius) and to be sure the bird does not get too hot or too cold. Please err on the side of caution and make sure the bird cannot accidentally touch the heating element directly. (Cover heating pads and water bottles with a towel). While the bird is warming up and calming down, you should be finding out where your local wildlife rehabilitation hospital is. (Resources listed below.) 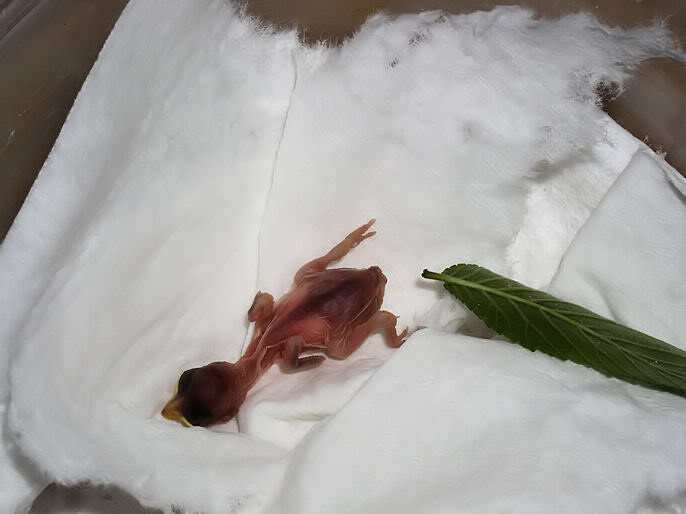 Some people think it would be fun to raise a bird and think they may give it the best care, but the truth is that nearly all orphaned baby birds are very dehydrated by the time they are discovered and need veterinary attention which we cannot replicate at home. Wildlife hospitals will have the best resources to save a bird in need. If you cannot immediately get to a wildlife hospital, or they are closed for the day, you will want to hydrate the bird yourself by offering Pedialyte or Gatorade with a syringe, pipette or eye dropper. This should be neither hot or cold, but room temperature. You will need to take great care to avoid affixiation (fluids going down the ‘wrong pipe.’) Contrary to most people’s instinct, you will want to place the syringe deep into the birds mouth (aiming towards the back right side (their right side) of their throat where their esophagus is) avoiding the glottis (small hole just behind the tongue. If the bird sort of swallows the tip of the syringe, this is ideal (and safe) because you are definitely getting the fluids past the glottis and into the crop. Feed slowly. If fluids well up in the bird’s mouth, stop and allow the bird to swallow. Pigeons and Doves do not get fed this way, they need to be crop fed and should be fed Exact if very young. This should only be done by people experienced with crop feeding. Later they get seed by beak from a tube with an opening that mimics a parent's beak. After a couple of hours of hydrating the bird, you will want to give some food. Baby birds need special nourishment as they grow (which wildlife centers will be able to offer them. They will feed a combination of insects and a balanced formula especially designed for baby birds.) However, following is a simplified diet which will keep your baby bird healthy until you can bring it to a wildlife center. You do not need to feed overnight, just be sure to begin your morning feeding around seven or eight hours after you stop the night before. If you find the bird late, feed it at least two insect meals after hydrating the bird before going to bed. Hopefully this has bought you enough time to get your baby bird to a Wildlife rehabilitation hospital. Last edited by FaeryBee; 11-26-2017 at 07:33 PM. This is excellent info. If you can find a downed nest put it in box or basket and tie it as high as you on a nearby tree or tall shrub. The parents should feed if they are alive.